HEPA (High-efficiency particulate air module) filters, to maintain positive air pressure inside the unit and to filter particles. Pass boxes, to sterilize the items including food which is being taken into the BMTU. Laminar hood, for sterile preparation of medications. RO water for all-purpose use in the BMTU. 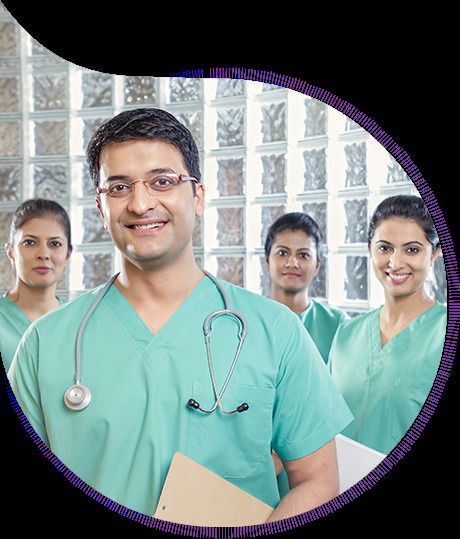 All these along with one to one barrier nursing and round the clock availability of trained doctors ensure a high success rate and very good patient outcome. WHAT IS STEM CELL TRANSPLANTATION/BONEMARROW TRANSPLANTATION? Hematopoetic stem cell transplant is the transfer of healthy blood forming cells from the donor to the recipient to cure or control certain medical conditions. Unlike solid organ transplants (liver, kidney), bone marrow transplant is not a surgical procedure. Have the capacity to produce one or more subsets of mature cells (form new cell/tissues). Bone marrow- bonemarrow is the spongy tissue found in the medullary cavity of the bone, which is rich in stem cells. Cord blood another source of stem cells, collected and stored at the time of birth. Transfusion dependent anemia like Thalassemia major, sickle cell anemia etc. Metabolic diseases (inborn errors of metabolism) and storage disorders. Autologous- Here, the patient’s own stem cells are harvested and stored. Then, after giving intensive treatment to control the disease, these cells are re-infused into the patient as a rescue procedure. It is used mainly in Stage IV (high risk) or relapsed solid tumours. Matched Sibling transplant (MSD)- HLA matched brother or sister is the donor. This is the best option with the highest success rate. Matched unrelated donor (MUD)- A HLA matched but unrelated person is the donor. Nowadays, many Stem cell registries are being maintained to aid in finding unrelated donors in case sibling isn’t there or is not a match. Haploidentical- Where either of the parents is the donor. In recent times, success rate with Haplo SCT has been steadily increasing. Mismatched sibling donor (MMSD)r mismatched unrelated donor (MMUD)- rarely used. Donor and recipient clinical examination and laboratory work up. Harvesting and storing the stem cells from the donor. Conditioning- Preparing the body of the recipient for the transplant. Routine diagnostic tests such as complete hemogram, biochemistry,X-ray,2DECHO , urinalysis and Screening for viral infections is done. Also, Human Leukocyte Antigen(HLA) typing and blood grouping are done to assess recipient/donor compatibility. This assessment of compatibility is essential to reduce risk of rejection of transplant. The stem cells are collected either from the bone marrow or the peripheral blood of the donor. Donors are given Inj G CSF to increase the number of stem cells prior to the collection in case the source of stem cells peripheral blood. Sometimes, stored cord can be used as the source of stem cells. Though none of the collection methods cause any harm to the donor, peripheral blood stem cell collection by apheresis is gaining popularity as it is less invasive and cumbersome to the donor, without the requirement of anaesthesia and with good success rate as bone marrow SCT. The collected stem cells are stored by cryopreservation. To suppress the immune system of the recipient to decrease chances of rejection of donorstem cells. It carried out by giving intensive chemotherapy with or without radiation. It is not a surgical procedure, rather a delicate and careful transfusion of the collected stem cells into the recipient via a central venous catheter. These stem cells then home in to the bone marrow of the recipient and starts proliferating after some time. Acute GvHD – Occurs during the first three months following the transplant. Chronic GvHD – Develops from acute GvHD and can cause symptoms for many years. Infections- risk of infections is high as the recipient’s immunity is very low during this process. With strict aseptic precautions and isolation, aggressive use of antibiotics and antifungals, proper nursing care etc this complication can be combated. Graft rejection- the recipients body may reject the donor cells. This can be controlled by the optimum use of immune suppressives in the recipient after the transplant. It usually takes 3 to 4 weeks for the recovery after SCT. Born in a middle class farmer family in Suryapet, little J is the first child of his parents. At 11 months of age unfortunately he developed significant dullness, vomiting and fever at 10 months age. He was brought to Rainbow Children’s hospital for treatment and was diagnosed with brain tumour in MRI scan. He got operated for same in July 2017 and It was a poorly differentiated Grade IV medulloblastoma tumour . Given his age, and and local spread to surrounding meninges it is a high risk tumour. As he was very young, Radiation therapy could not be given post surgery. Post Surgery MRI revealed residual tumour along with spinal meningeal enhancement (?metastasis). In view of the high risk nature of the child’s disease, parents were counselled regarding the chances of cure and survival of the child.He was started on chemotherapy under the care of Dr Sirisha Rani, Sr Consultant in Pediatric Hematology Oncology, rainbow childrens hospital, Banjara hills. After 5 cycles of chemotherapy, repeat MRI showed complete clearance of the tumour and spinal meningeal enhancement. Following this good response it was decided to consolidate his tumour remission with High dose chemotherapy followed by Autologous stem cell transplantation. The transplantation was carried out in the state of the art Bone marrow transplantation unit (BMTU) at Rainbow Children’s hospital Banjara hills. During the conditioning as well as post transplantation, he was closely monitored. With high clinical acumen, timely use of prophylactic antibiotics and excellent nursing care his course was smooth without any major complications and he was successfully discharged.